I’ve had so many fun posts to share recently that one from my trip to Paducah got pushed to the bottom of the pile. When I discovered this I just knew it had to be this week’s topic! Cindy is a great teacher and has developed her own techniques that are virtually no fail. She was featured in the most recent issue of American Quilter Magazine and I would recommend her classes to everyone. We purchased a kit for the class which included her specially prepared for dyeing fabric, the dyes and almost everything else we needed: We did a bit of pre-treating of the fabric, twisted and turned it in a number of different ways, and then placed it in Cindy’s very clever “sling” type holder. We had the choice of a number of different color palettes. Laura chose the dark one above and I chose the lighter. 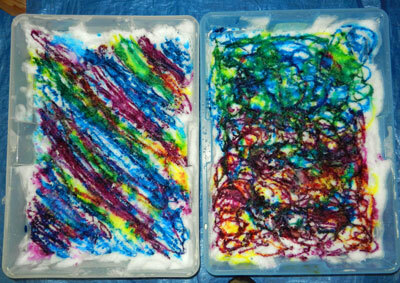 Once the ice melted, the fabric looked really yummy! Once they were rinsed and dried we laid them all out on the deck and took turns picking so we each got a good mix of lights and darks. You may remember that I awarded my judges choice ribbon at the Evergreen Quilt Show to Kim Frisk’s quilt – “Wherever the Wind Blows”, which was made with rust dyed fabric (click here to read about it!). I mentioned that I wanted to give rust dyeing a try – and I did! I watched a few Youtube videos, hunted for some rusty stuff, gathered up the supplies – and found it to be easy and fun. I’ve never been into fabric creating – I’d rather buy from others who are good at it, but I enjoyed this so much – I did it twice! Would you like to try it? If not, scroll down to see the other pieces. If so, read on 🙂 ! Soak fabric in vinegar and wring out. Tear open a large plastic bag and lay the fabric on it (manipulate if you like). Put on gloves and arrange rusty items on top. If using steel wool – pull apart and spread across the fabric, then put vinegar in a spray bottle and spray away. Cover with more plastic, or another piece of fabric, and then more plastic. It should be wrapped in plastic to keep the warmth in, but loosely enough to allow air to get in and cause the rust to form. When done, fill a 5 gallon pail with 4 gallons of water and dissolve 1/2 cup of salt in the water. Rinse items in the salt bath and then rinse with more water. Hang out to dry, iron and enjoy! The steel wool pieces in the picture above were made like a plastic/fabric/steel wool/fabric/plastic sandwich, that then rolled up jelly roll style. After my first attempt, I read that putting bags of rice/beans on top of the plastic will help hold things closer to the rust. Nails, washers, a star, steel wool in patches, and a heavy chain that gave the look of a tire tread! Pieces of rusty sheet metal and nails. A doily given to me by Barb. This one was at the bottom of the pile! I did one additional piece that night, using a chunk of rusty chicken wire. I started with a yard of fabric and folded it in half with the chicken wire in between. This was weighted down with a bag of top soil (remember – we were in the barn 🙂 ). I think it’s my favorite. Wouldn’t it make a great honey bee quilt? Have you done any rust dyeing? Please send pictures of any exciting pieces you’ve made. I’ll share pictures of the other pieces made that night in a future post. After last week’s baby shower, all of the excitement of Christmas and flying across the country twice to transport grandkids took its toll. I spent the rest of the weekend as a couch potato. On Monday I realized I hadn’t rinsed the dye out of the baby things. 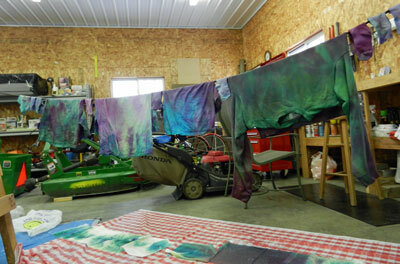 Rinsing and washing was a bit of an undertaking, but mom and I persevered and the results were fun, fun, fun! Everything is folded and ready to deliver with great expectations! Can’t wait for our sweet little girl to arrive! 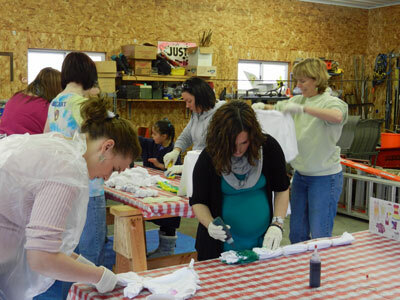 When our son and daughter-in-law were expecting Sommer, I had a “tie dye” baby shower for Betsy and her friends. 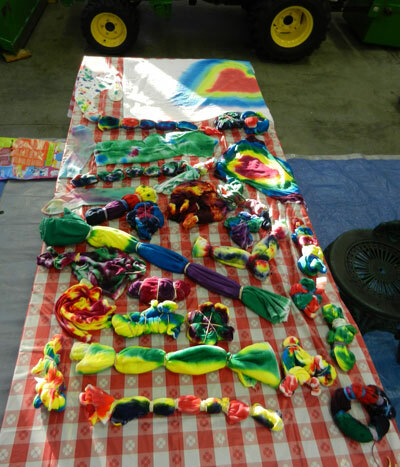 We tie dyed bibs, burp cloths and onsies – and had a lot of fun! (click here to read that post). Sommer is almost 4 now (I can’t believe how fast time flies! ), and my niece is expecting her first child – a little girl. 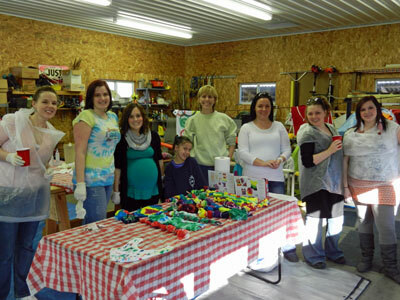 So my Mom, Betsy and I decided to throw a tie dye baby shower for Brianne this past Saturday! This time we really had fun with the theme. 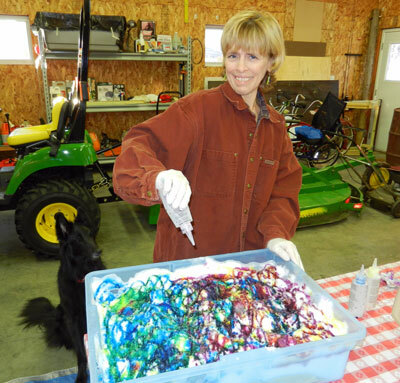 Betsy made wonderful decorations and we even found a local bakery that made us tie dyed cupcakes – inside and out! They were as delicious as they were beautiful. After brunch we headed to Mike’s shed, put on our plastic garbage bags, and the dying began! These pieces were covered with plastic and left to set while we went in for gift opening. I’ll share the finished pieces, after they’re rinsed and dried. I can’t wait to see how they all turn out! Here’s a parting shot that should make you smile. Mom and I did a baby shower idea search on the internet and a picture of a unique fruit salad made us laugh out loud. I had to make it. I’m sure Scott and Brianne’s baby will be much cuter 😀 ! 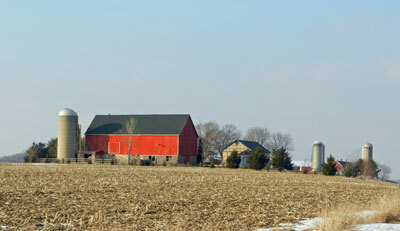 For years my dear friend Nancy has been telling me about her daughter Jane, and Jane’s wonderful farm. I recently began following Jane’s blog and love to read about her Sheep and lambs. Her farm produces wool, meat and garden produce. Recently Jane blogged about a “Soil Quilt”. A friend of hers sent her a square of white fabric and asked her to bury it in her garden. To read all the details go to: https://autumnlarchfarm.wordpress.com/2015/05/12/weaving-the-great-soil-quilt/ . Well, in Jane’s last post, she unearthed her square and I was surprised and impressed to see how the earth had “dyed” her fabric. It’s very interesting to see the variety of the different pieces. Kind of makes me want to dig a hole and bury some fabric in the back yard. Thanks Jane, for letting me share your soil quilt adventure! Have you ever buried fabric? Or do you think you will now 🙂 ? Blaudruck, is a German word translated Blue Print. It is a dyeing method in which a white pattern is formed on a blue background. It uses what is called “reserve pressure” in which the fabric is printed with a resist (called a “Papp” in German) and then indigo dyed. Handdruck is a German word that can mean “hand printing”. We were able to experience both first hand on our tour in Rostock, Germany. We began the tour on the outskirts of Rostock, just down from St. Peter’s church, on what looked to be a residential street. On the first level of Christine and Reinhard Haase’s home we were treated to a demonstration of Handdruck, and a display of both Handdruck and Blaudruck created by the Haase’s. Note the logo to the right on the sign above – Haase is German for hares! Reinhard is a delightful, bearded man with a great sense of humor, who didn’t speak a word of English – and yet we all thoroughly enjoyed his demonstration! They use very traditional German methods for their art, and he had a book showing how they still do it the old fashioned way. Then he jumped right in! He demonstrated how he loaded the dye onto the traditional blocks, lined up the design, and printed a table runner before our eyes. The Handdruck “direct printing” demonstration was easy to understand and he made it look quite effortless (I’m sure practice has a lot to do with it!). A Blaudruck demonstration would have been more difficult to do as the Papp (a resist made of the sap of birch trees and clay – if I understood our guide correctly) would be applied with the “blocks”, dried, indigo dyed and then washed in a special solution to remove the Papp. After the demonstration we were able look more closely at some of the shop samples and make some purchases. I’m so pleased to own a blaudruck runner and egg cozy from Reinhard’s shop. I’m also happy that he agreed to a hug and a photograph! What a delightful and educational visit! 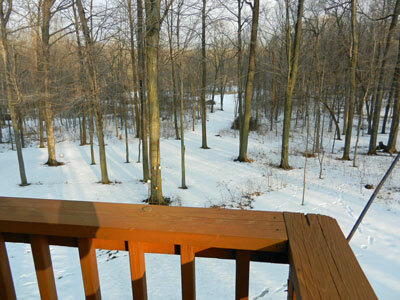 Oh No – No Snow! It’s hard to believe the contrast. If you have no snow, do not despair. 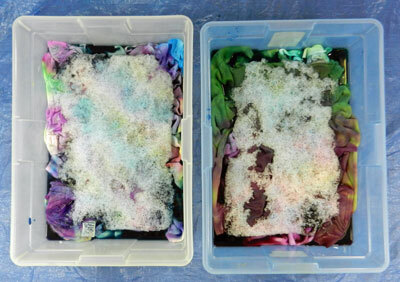 There is such a thing as “Freeze Dyeing”. Just go to the Milwaukee Art Quilters blog: http://milwaukeeartquilters.wordpress.com/page/2/ and scroll down to the directions in the September 25th post. 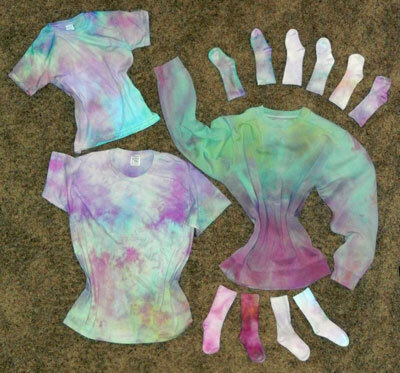 The tie dyeing was a hit and the results were such fun! 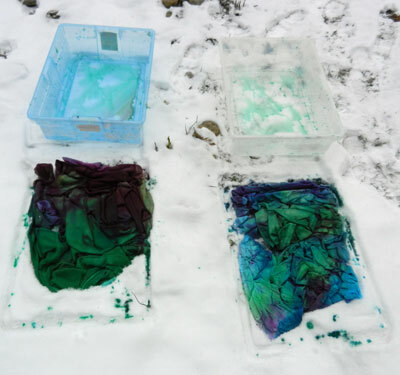 Now I’d like to share my snow dyeing saga and what I learned along the way. 5. Then it was off to the laundromat for 2 cold water washes (with Color Catchers™ to absorb the excess dye) and a ride in the dryer. I was really quite pleased, but I didn’t like the way the fabric sat in the “muddy” water at the bottom of the bin while the snow melted. Thanks to Johanna for her comment about elevating the fabric with an old oven rack or cookie rack. Other suggestions were inverted deli containers along the bottom of the bin or even leftover chunks of pvc pipe. I’m anxious to try this out on some of the leftover hunks of light value fabric in my stash. New life for old fabric! But I’d better get at it before the snow’s all gone! 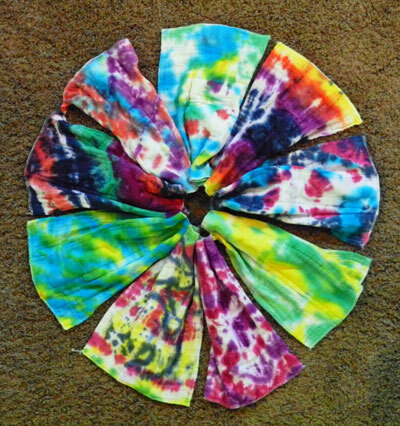 Today I threw a baby shower with a twist for my daughter-in-law Betsy: she invited her girlfriends and we tie-dyed onesies, bibs and burp cloths. We even did t-shirts for Daddy and Mommy. What a blast! The original idea came from Kathie Boucher with inspiration from Laura Krasinski (both friends from the Milwaukee Art Quilters). 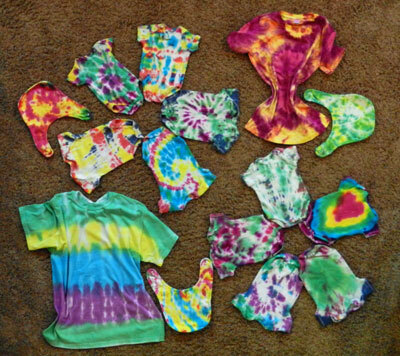 I purchased tie-dye kits from Joann Fabrics. Grandpa Mike was kind enough to make room in his barn. We covered the floor and tables with plastic and then the fun began. Artists come in all sizes. The girls did a great job, but they didn’t get to see the finished product yet (it’s all still damp and under plastic). 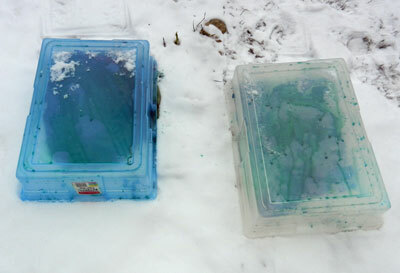 After everyone left I decided it was time to try my hand at snow dyeing. So I mixed up a few new bottles of dye, removed my old, stained sweatshirt, grabbed a few pair of bamboo socks for the grandkids in Washington State and phase II began. 1. I misted everything with water and bunched it in the bottom of 2 bins. 2. Grandpa shoveled the bins full of snow. 3. I patted down the snow and “made snow cones” (Annabelle is watching and wondering what I’m doing). Next week I’ll post the pictures of all the “afters”! 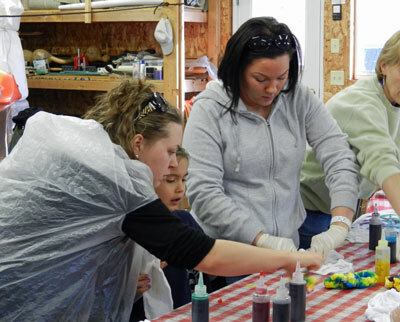 Have you had any group dyeing adventures?